Teachers are happy to do it, says Auckland principal Malcolm Milner, it’s just the kind of people they are and the kind of people you want to have in teaching…. 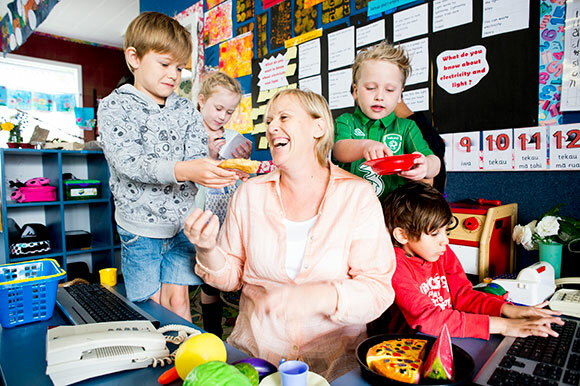 Teacher Adrienne Browne at Balmoral School in Auckland with some of the things she has bought for her class. Teachers are happy to do it, says Auckland principal Malcolm Milner, it’s just the kind of people they are and the kind of people you want to have in teaching. It’s not just teachers though – support staff do it, principals do it, kindergarten staff to it, ECE centre workers do it: they dip into their wallets to pay for an astonishing array of resources for children. A phone survey of 250 NZEI members found that 80% spend their own money to meet the needs of children. Of these 80%, 64% spend up to $200 a year, 22% spend up to $500 and 14% put up $500 or more a year. On a conservative calculation, this would total about $10 million a year of extra funding closely targeted to need” and that is only NZEI members. Many thousands more secondary teachers would also be funding the system from wages and salaries. A lot of spending is on classroom resources – stationary, books, games, activities, and the like. But one NZEI teacher owned up to spending $4000 a year of his own money so a group of at-risk boys at his school could attend a sports academy in the city. Another bought a Mac laptop to manage the school’s ipads. Another is paying a tutor for the music programme because “the school’s budget is empty”. School productions, costumes and dress-ups were other popular items for spending. Often teachers have a small classroom budget of $100-200 a year but many outspend it, or are simply too busy to collect the receipts and fill out the forms to get reimbursed for a series of $10 items. “It’s easier just to take it out of your own pocket,” said one. At the same time as educators give and give, the government has hinted that radical changes to the way schools are funded are being considered. The Minister of Education Hekia Parata has described decile funding as a “blunt instrument” and has talked about more “targeted” funding. In Wellington, the rumour-mill is alive with talk of a new system of funding that looks remarkably like vouchers. School, and possibly ECE, funding would largely be on the basis of the child – funding would go with the child to the school or centre they attended. The individual funding would be tailored according to the demographic profile of the child. He agrees that decile funding is a blunt instrument, but says that sometimes blunt works. Decile funding recognised the poverty in communities, which could be a more significant factor than individual poverty in a school community. This idea is backed by international evidence that shows a stronger link between educational underachievement and community poverty (disadvantages accumulating in a community such as high unemployment, crime, addiction, poor housing, fewer resources) than between underachievement and individual poverty. The transaction costs of decile funding are also low, says Milner, who has been principal of a low decile school, whereas individualised funding would introduce more bureaucracy into the system. The failure of Novopay is a stark warning that technological failure in complex systems can have dire consequences. Decile funding has been criticised as leading to “white flight” as parents head to higher decile schools. But if deciles went, Milner says, it is likely that National Standards data would simply become a proxy for deciles. National Standards data is meaningless for the purpose of school comparison but at a very broad-brush level it does give an indication of the socio-economic status of a school. Milner suggests that the Ministry of Education become more creative in how it packages decile funding so that parents can choose a school more on its professional capability rather than on its results on the standardised testing of children, which simply reflects their socio-economic status. “The real tragedy is that government isn’t talking in a meaningful way with educators about the proposed changes,” he says. The lessons of Novopay and classroom sizes and the IES would appear not to have been learnt.